So I’m home sick, with a fever and bored out of my skull. What do I do? I decide it’s time to watch a cheesy medieval movie. I booted up my Amazon streaming and picked Dungeons and Dragons- Wrath of the Dragon God . Why you ask? Well, I used to play D&D as a teenager and well into my twenties. Sadly, life and responsibility got in the way and there was no more time to fight dragons, battle liches and save kingdoms over cans of Coke and boxes of pizza. I was feeling nostalgic in my malaise today so I wanted to see just how bad can this be and how close to the D&D experience can they make a fantasy film? Well, it’s bad alright but, it’s pretty bang on in terms of role playing and characters, right down to the cornball character speak. What wouldn’t fly for decent dialogue in any other movie, works well here because it’s an accurate representation of how we talked when we were in character, sitting around a table, rolling D20s, and eating greasy pizza. Let me start off by saying I didn’t have very high expectations going into this film. For one, it has no recognisable actors; we’re talking “Z” list here. Secondly, the film is low budget, and I mean low. CGI spend was not a priority with this movie; neither was make-up for that matter. Having said all that, did I like the movie? “Like” is a strong word when it comes to this film, but I can’t say I hated it. I’ve seen other movies in this genre that were way worse because they took themselves too seriously. These guys are basically playing out a D&D module in front of a camera. There is no need to detail historical accuracy here because it’s all mock-medieval fantasy. 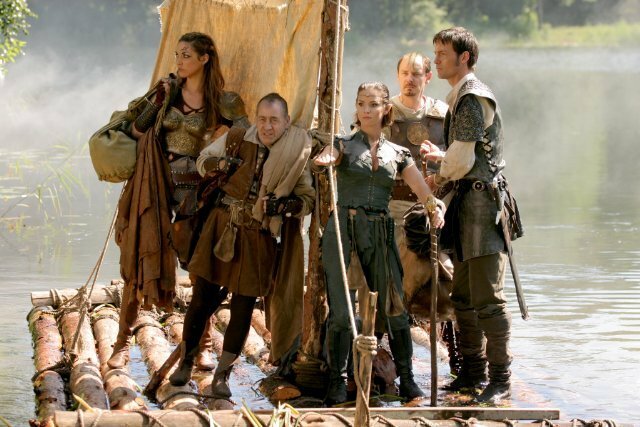 These are a bunch of low budget actors putting together a story while trying to keep faithful to the D&D canon, which, with all their bad acting, they manage to pull off in a decent manner. This movie, made in 2005, was preceded by a really terrible D&D movie from 2000 (which I haven’t seen), so it’s a sequel that occurs one hundred years after the plot of the last film. Damodar, the evil wizard, played by Bruce Payne, has been cursed to wander the earth undead. He has decided to exact revenge against the inhabitants of Izmir, who are the descendants of those who defeated him. He finds the Orb of Faluzure, linked to the Dragon God Faluzure imprisoned beneath a mountain. He manages to cure himself of the curse and come back to life. He decides the best way to get his revenge would be to release the dragon onto the hapless population of Izmir, destroying them all in one fell swoop (no pun intended). Meanwhile, former Captain of the King’s guard, now boring tax man, Lord Berek, played by Mark Dymond, and his mage wife, Melora, played by Clemency Burton-Hill, discover that Faluzure is sleeping in the mountain right under their noses. Melora tries to find the Orb by using her magics but Damodar manages to curse her and she begins slowly turning undead. Berek is asked to form a band of heroes to combat Damodar, and he chooses: the beautiful fighter Barbarian woman, Lux, played by Ellie Chidzey, Dorian, a male cleric of Obad-Hai, played by Steven Elder, a female elf-wizard named Ormaline, played by Lucy Gaskell and Nim, a human rogue played by Tim Stern. Their quest? To find the vault of the wizard Malek to obtain his magical scrying pool so they can locate the Orb and Damodar. Left to Right: Lux, Nim, Ormaline, Dorian and Berek. So we have a typical D&D cast: two fighters, a mage, a cleric and a thief. What ensues is a typical role playing session on screen – they fight a lich, another dragon, and a band of brigands while solving riddles. We all know the ending – they eventually defeat Damodar, destroy the Orb and save the populace….pack up your dice, see you next Sunday, who’s ordering pizza? This movie certainly isn’t winning any awards, and it’s hard to watch sometimes. The dialogue is clunky and cheesy, but that’s not the real issue here because it’s meant to be bad. D&D is about magic and monsters and stilted, perceived “medieval” archaic speech. The acting was tolerable and in some places, even decent. I actually enjoyed Nim’s charcater, although I found the attempt at turning the relationship between Lux and Nim into a Gimli-Legolas type relationship really didn’t work; it was too forced, and there was too little time to flesh it out. They were better to watch when they disliked each other. Lux is every conceiveable Barbarian bad 1980s stereotype you can dream up: she’s clad in torn leather, smoking hot and completely brainless. On screen, she is mildly entertaining at best. Berek has to be the lamest and most boring group leader ever. I couldn’t get into his character, he wasn’t interesting or fun to watch. Ormaline was even worse, she was just dreadful, which annoyed me because I used to play an elf-mage back in my D&D days so I had hoped to see a decent translation of this type of character onscreen. She limped through the scenes, she wasn’t much of a character, she was more thrown in to be able to showcase the spectacularly bad CGI. Dorian the cleric was another completely forgettable character. Fortunately, you don’t have to endure much of him in this film. The two best heroes were Nim and Lux. There was at least some semblance of acting going on with those two and moments of believable chemistry. Just because this isn’t a historical movie in the traditional sense doesn’t mean you can run around in costume and snarl, hoping that makes up for your lack of acting skill. It’s a fantasy, but you still need to act so you can pull the audience into your make-believe world. Almost none of that happened here, and when it did, it was a flash, and then gone. If you’re a former or current D&D player, and you’re looking for a walk down memory lane, this movie may be somewhat enjoyable for a laugh and nostalgia. I enjoyed bits of it even though my dog could’ve churned out better CGI and I’ve seen kiddie Christmas concerts with more acting talent. It was cool to see objects and lingo used in the game come alive on screen. I just wish someone would come along and do this so much better. For an afternoon in sick and with nothing to do, it was barely tolerable. There are so many former, current and future D&D players out there, I would love to see a director make a decent attempt at portraying a favourite past time and really doing it justice. This was not it.